Kik Messenger has passed the 50 million registered users mark and has updated its iOS and Android apps to add push notifications for the service’s Kik Card extension apps as it looks to transform its messaging service into a platform. At its current pace of 200,000 new users per day, Kik is set to double up to 100 million users before the end of this year. The company hit 30 million users last November as it launched its first Kik Cards HTML5 apps. Since then, Kik has seen over 25 million Card installations from within its own app. Currently only five HTML5 apps are available: a new game called Squared, Reddit Pics, YouTube Videos, a Sketch drawing app and Bing-powered Image Search, but the company’s master plan is to build Kik Cards into a full-fledged app ecosystem. Users have installed Squared more than one million times and played over 30 million minutes of the game since the game arrived on Kik in February. Livingston said in an interview that building Kik’s platform took two years. Thursday’s release brings in-app push notifications to Cards, something the company says is a first for HTML5 development. Kik has staged an impressive comeback from its early struggles. The service was a hit when it first arrived in 2010, racking up a million downloads in just 15 days and claiming the title of fastest growing app ever at the time. However, Kik faced a huge setback after BlackBerry kicked the app off App World, revoked access to push notifications and sued for patent infringement. The disagreement was especially personal because Livingston had previously worked for BlackBerry on its messenger service. After the BlackBerry kerfuffle, Kik saw its growth drop from 100,000 users a day to the low thousands a week. “We went from the bottom of the world to top of the world to the bottom of the world in one month,” he recalled. Livingston attributed the app’s success to a crucial decision that Kik made to base its service around usernames instead of tying it to users’ phone numbers, as rival Whatsapp and similar services have done. According to Livingston, the move resulted in users passing out their Kik IDs on mobile apps like Instagram and MeetMe. While Whatsapp arguably gets more attention, Livingston claims that Kik is actually growing faster than its competitor on Android and is close to catching up in terms of overall users in the US. The BlackBerry conflict served as the motivation for Kik’s long road to establishing itself as a platform and not just a messaging app. “We had to force ourselves to ask a question: How do we differentiate and win and put it on BlackBerry?” he said. Livingston says Kik was the first to launch a native platform, almost two years ago. Since then, Asian messaging services like Line, Kakao, and WeChat have all emerged with their own third-party platforms. Line and Kakao in particular have leveraged their core apps to create successful gaming titles. In the West, Kik believes it’s got a head start. Livingston says Whatsapp is the only other messaging service in North America that’s big enough to support a platform, and the competitor hasn’t shown any signs that it’s making the move. The difference between Kik’s platform play and its competitors’ is that Kik is going with HTML5 apps that reside within its own messenger app, while rivals are opting for native apps connected by a social layer. Livingston says it took the full two years to write the HTML5 libraries from scratch, and the company plans to open source them as a resource for developers. I’m personally skeptical about the decision to go with Web apps. After all, Facebook admitted that betting on HTML5 was “one of the, if not THE biggest strategic mistake” that the company made. The company just announced the culmination of its new native app strategy: the Facebook Home app launcher. Still, Kik’s not the only one betting on HTML5. Firefox is set to release its HTML5-focused mobile OS later this year and the upcoming Tizen is also built around Web apps. Ultimately, the strength of any ecosystem is going to come down to whether developers get behind the platform and create interesting content for users. “The Web is inevitable – it’s just who and when. We want to be the who and we want the when to be now,” Livington said. 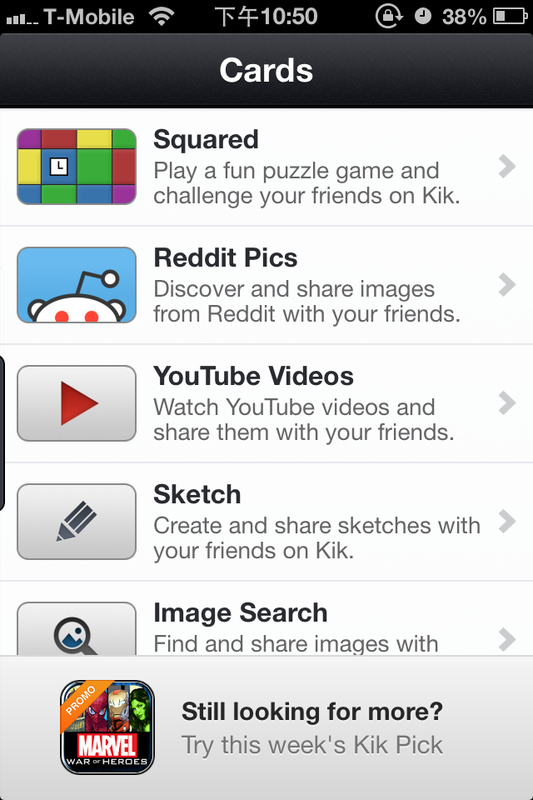 Kik has built its HTML5 platform and attracted 50 million users. Now we will see if the developers will come too.